Do any of your students get in a mess with “double borrowing”? There’s a very simple solution which builds on their existing knowledge of subtraction with borrowing…. Much harder subtraction – the borrowing cascades from left to right and is very likely to go wrong. 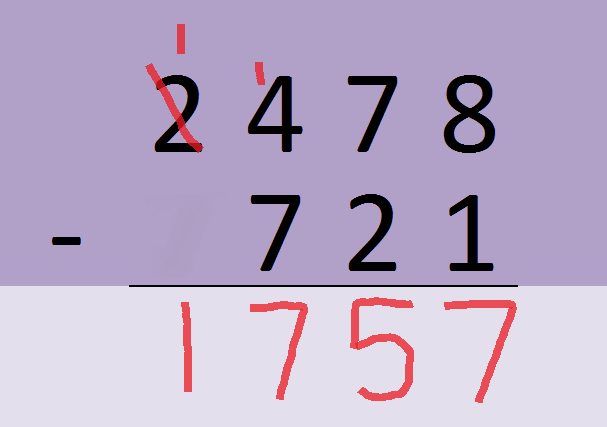 There is a very simple solution to this, encourage the student to look at the number differently. 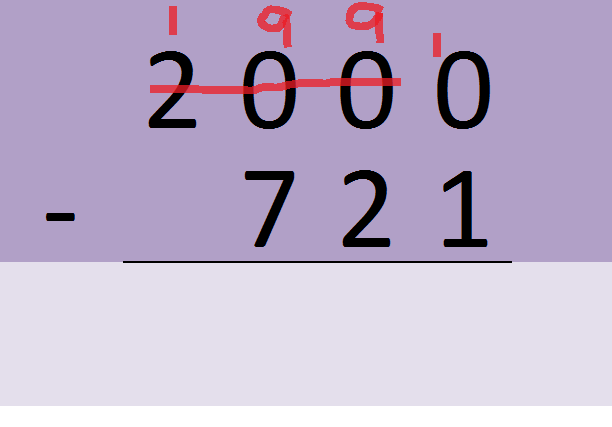 Borrow ONCE from the “200” on the top, which becomes 199. 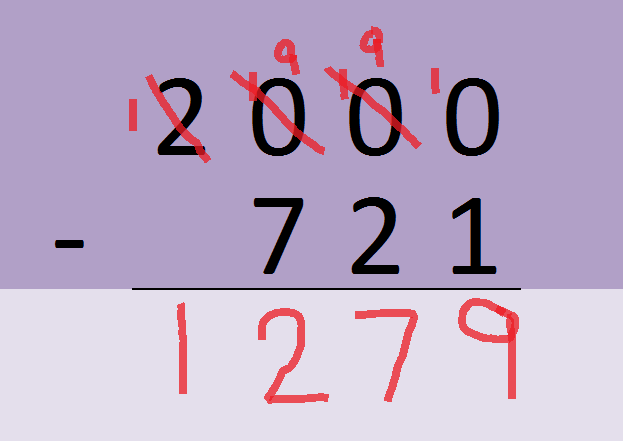 Borrow ONCE from the “200” in the top number – now this sum is ready to do, and there’s far less that can go wrong. Try it on a student near you, and use the reply box to tell readers what happened next! 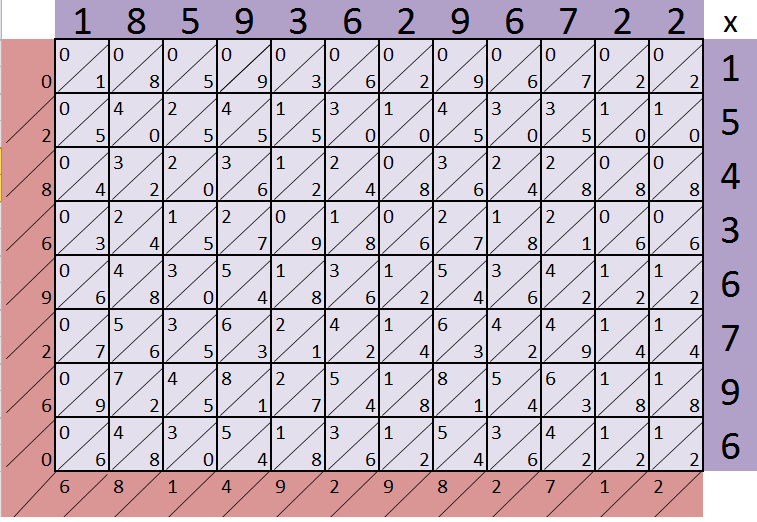 Chinese Multiplication, or how to multiply together VERY large numbers! 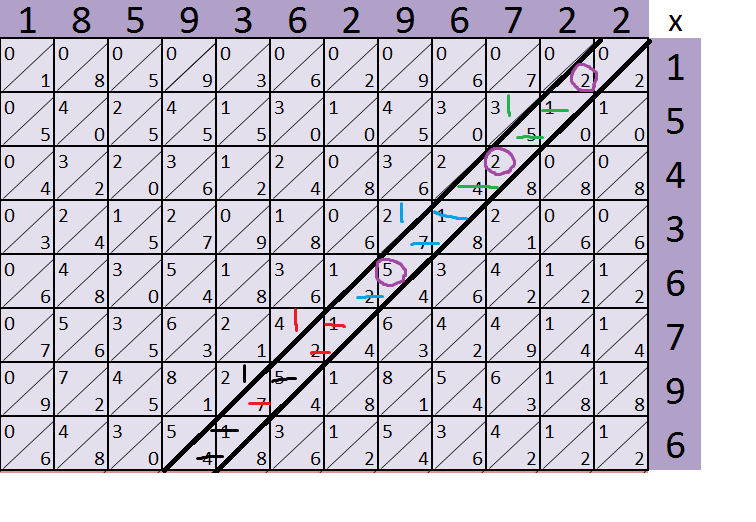 Chinese multiplication has been explained many times in many places on the Internet. This is a quick recap of the way I do it…. The kids I’ve taught, especially the more able ones, really like this way of multiplying numbers because it’s SOOOO easy to build up to very large numbers. Within 20 minutes, a group of ambitious mathematicians has commandeered the class whiteboard and tried to do an ENORMOUS sum like 185936296722 x 15436796 and got an answer. This gives the teacher a problem. How can the sum be checked? Calculators and EXCEL will round the answer to only 10 or so significant figures, which is pretty hopeless for checking the work. Here is a link to an EXCEL spreadsheet that will do these HUGE sums so you can check pupils’ (or your own) work. They could make ten from the 4,1 and 5, then another from 7,2 and 1, and anotherfrom 1,4 and 5. Cross them out neatly and there’s not really much more to add! 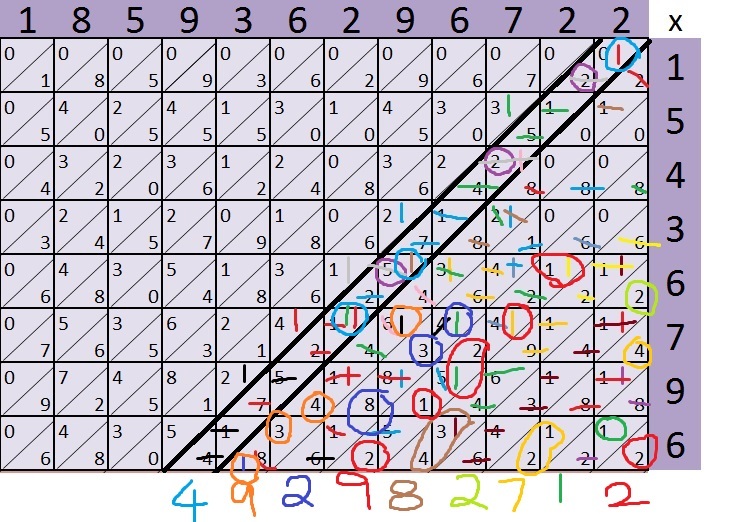 The nice thing is you can tackly any column you like, in any order, which is great for mathematicians who don’t know their right from their left! (except of course the TENS have to move left!). Most of the numbers made TENS! Each ten has been done in a distinct colour for clarity. 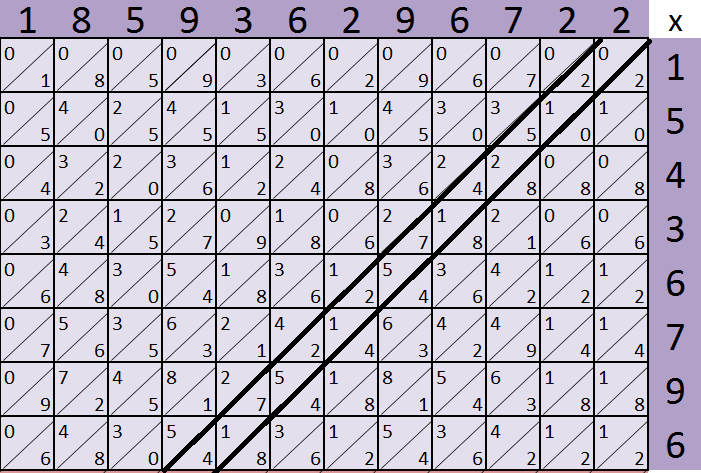 Once this TEN-hunting is complete, the final pass is to add up any digits that are left. How to use your calculator to understand Standard Form. These instructions work on a CASIO fx-83GT PLUS, which is widely used in schools and will, if you learn to drive it with confidence, do a tremendous number of different sorts of Maths. 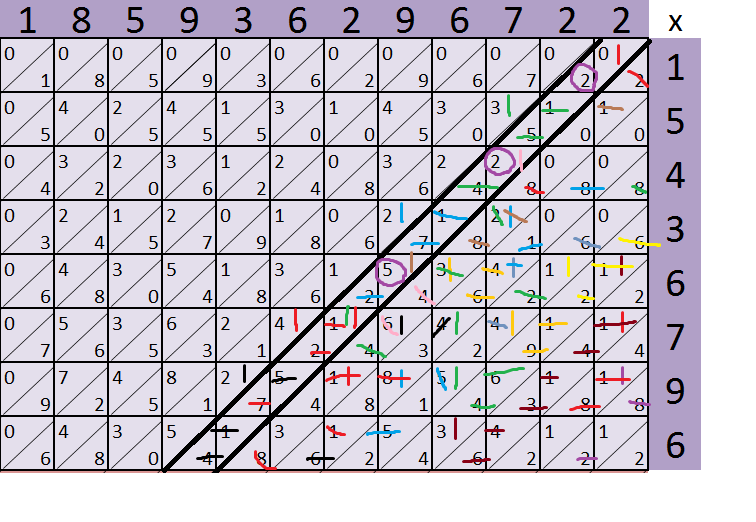 it will offer you a choice of Sci 0~9 and this means how accurately it will display the answers. 3 is OK, but you might want to experiment with 4 and 5 as well, to see for yourself what difference it makes. To make your calculator display your answers normally again, shift mode 8 1 will do the trick. mode 8 is “Norm”, normal mode.